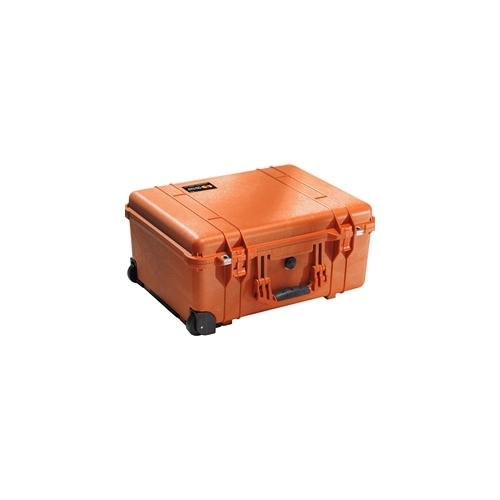 Pelican™ 1560 Case No Foam (Orange) on Sale Today! The Pelican™ 1560 is a durable, watertight, airtight, dust-proof, chemical-resistant and corrosion-proof hard case used to carry any kind of equipment that needs to be protected from the elements. Just like all Pelican Cases the 1560 case is made of ultra-high impact structural copolymer that makes it extremely strong and durable. It has a 0.25" (6.4 mm) neoprene o-ring, two easy-open double throw latches that seal perfectly. It has a built-in, automatic pressure equalization valve for changes in altitude or temperature. The case uses stainless steel hardware and has padlock protectors to provide added strength and extra security against cutting and theft. It is carried by a comfortable rubber over-molded top and side handles, retractable pull extension handle and built-in wheels. For over 30 years Pelican™ has built a reputation for manufacturing the toughest cases in the world. As a matter of fact, we invented the category. Over these years we've seen our cases used for some fairly crazy activities...and important ones too.